no big dill: Project Run and Play Finale: O Pop! Project Run and Play Finale: O Pop! so I pulled out the dye, of course! and ruffled 4 yards of fabric for the skirt. The "O" button and tie was serendipitous. so I needed to add a little something. thumb holes for a bit more interest. both front and back angles. mentally analyzing the whole story. An Orange, Obi adorned clad Olive=O Pop! ABSOLUTELY AMAZING as always!! I love the way the obi creates a bustle effect in the back! You got my vote! Just amazing. Brendon and I literally ooh'ed and aah'ed as we looked at this beautiful dress! You are talented! We love it! It is divine! I fell in love with the ruffles (I am a ruffle person too)and almost died when I saw that gorgeous antique kimono fabric! I am so amazed by this dress! I love everything about it, and I normally dislike orange. Will you be posting a tutorial on how to make this? Katy.... I had to came here and tell you are the best...and your dressses are so beautiful!!!! I loveevry thing...and this is absolutely adorable!!!! I hope my english is quite right! I loved this photo shoot. Olive is super cute!!! 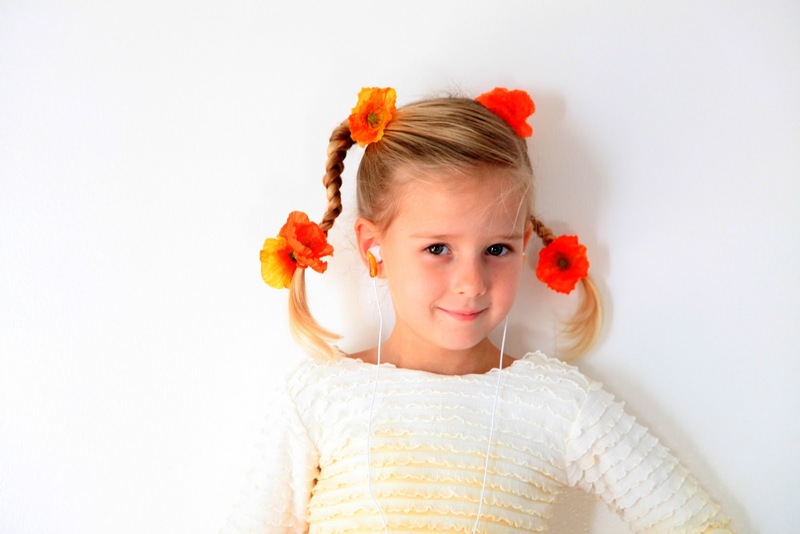 You're so creative using the ear plugs and the photo looks adorable. I love the dress! The form fitting bodice with the full puffy skirt is a perfect combination. I love the colors. You're brilliant! I voted and you're ahead. Katy. I love the drama of your photos! Well done! The obi is such a beautiful contrast the the ruffles! OH MY! Karen G.-Thanks for your vote! Ann-I love that Brendon likes to participate. Valeria-Your English portrayed beautiful compliments, thank you! Susie-Olive is always fun to photograph, just need a plain background and some natural light! I NEED this in an adult size 10, please! Fabulous. This is absolutely my favourite of the entire competition. Love the ruffles vs geometry, the pretty and the structure. And the colour! So cool! I can't wait for the tutorial! This is the perfect looking Easter dress! :) Both my daughters would LOVE it! Thanks (in advance) for your tutorial! I just don't know what to say! this outfit is just MAGNIFIQUE again... you're the queen of ruffles and color! Katy this is breathtaking. I love it. I admit I was like ok when I saw the picture of the front but then when I saw the obi on the back I went OOOOOOOOKAY! I got it then. It really tied everything together PERFECTLY! I mean the ombre, the ruffles and then BAM the obi in the back. I mean it was PERFECT! the little "o" for the obi was awesome too. love, love, love it. Oh my goodness, I'm in love with all the ruffles! So beautiful & I love the back! A.MAZ.ING! Popping back over to say you once again have amazed me with your talent. Orange: my all time favorite color. Of coarse you have my vote. amazing. so amazing. i am just in awe! Wow this dress from front on...is INCREDIBLE!!! But to see the back as well...You just blew me out of the water!!! You have an amazing talent!! Did I see you have an etsy shop....could you send me the link?? Beautiful outfit, phototgraphy and model! I would love to see the kimono thing from the front. All the pictures with that on are just shown from the back. Super Super cute dress!!! Oh, Katy....you had me at ORANGE! What a juicy confection of a dress. Amazing!!! What a beautiful creation! Love checking out your creative photo shoots also...I leave your site inspired!! I LOVE those ruffles and the whole design is absolutely gorgeous! I voted for you - again!! I LOVE this dress!! Totally amazing!! What can I say that hasn't been said? Amazing and inspiring! You are an artist. You are pure artist! I love your blog... like no other!!! All the Project Run and Play designs were pure genius. Thank you! This is just beautiful!! I went to vote and sent the link to several girlfriends. Gorgeous Katy! You've inspired me to try more orange! Amazingly beautiful! Very refreshing colors! Divine inspiration at work here Katy! Orange doesn't even do justice to the hues you have going on. The ruffles appear like water, you can sense the movement in them. I just love the line the obi creates at the back. Stunning!!! I have been following all your entries and I keep asking myself why you make the back way nicer than the front. So why not reverse it? p.s. I hope you win. Love your creations...just to give you a heads up I mentioned you on my blog-hoping for many votes to head your way!!! yet again, absolutely beautiful!!!!!!!! I can't WAIT for the tutorial for this one!!! I keep coming back to admire the beauty and creativity of this piece. Absolutely gorgeous! Oh serious.... this dress is amazing. Did you take pictures for a tutorial?? Please please say you did. This dress is too amazing not to want to re-create somehow!! OH MY GOODNESS!!! That is incredible. I am so in love with that dress!!! jane p-Ryan and I both had that thought as I was editing my photos. Perhaps I will do another--just backwards! It would actually be easier to do in reverse. WOW! I'm truly speechless! Amazing Katy, really really really amazing! You definitely have my vote!! I'm in love with this dress! 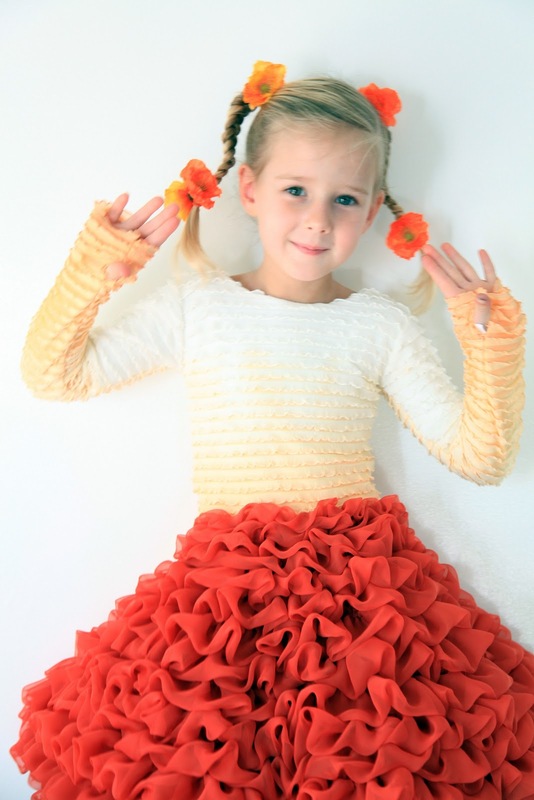 The skirt with the ruffles and the obi accent. Oh my. I totally want one in my size! I adore the Obi back! So amazing. Sophisticated and light hearted and strong and girlie all at once. Thanks for the eye candy! Wow. This is gorgeous! And fun! 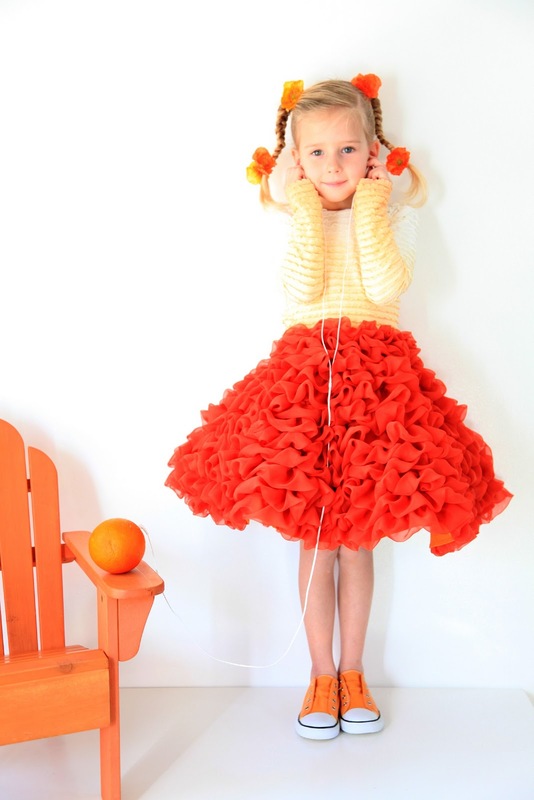 I love all the orange and ruffles and the shoes totally make it. Your photography is just as great as your designing. Good luck. This is crazy and I dont know if I have enough skill to make it but I WANT TOO. Fantastic. You so deserve to win. wow! this is amazing. I absolutely adore it. YOU ARE AMAZING! (I've always known you are! )I'm sorry I was too late to vote, but I hope your've gotten enough votes to win! I know you'll keep on creating! congrats on winning - you had my vote! This is so absolutely stunning. I just stumbled upon your blog and seriously I feel like a little kid saying "wow I want to be you when I grow up." I love your work! You so deserved to win! Please please someday have a sewing weekend where you can wow us all and teach us how to "never miss a trick" when sewing! Splendid. Any chance of seing the tutorial for this dress? Please pretty please. I adore this dress! I really hope you make a tutorial for it. I have never sewn something so intricate but I am up for the challenge for something so beautiful. Gorgeous! I know your busy but as a few others asked any chance of a tutorial maybe just for the skirt? My daughter is in LOVE with this dress is there a tutorial or a pattern for it?? She says she MUST have it for her Xmas dress! !